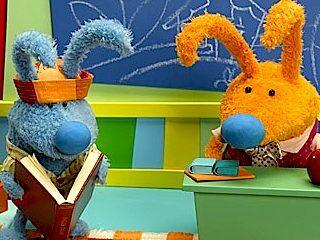 A comedy/variety series for preschoolers starring bunny puppets. 1. 1- 1                10 Nov 07   Hello Bunnies! 2. 1- 2                11 Nov 07   Bunny Funnies! 3. 1- 3                17 Nov 07   Bunny Giggles! 5. 1- 5                24 Nov 07   Bunny Shenanigans! 6. 1- 6                 1 Dec 07   Wintertime in Bunnytown! 7. 1- 7                 8 Dec 07   Bunny Ha Ha's! 9. 1- 9                15 Dec 07   Hiya Bunnies! 0. 1-16                15 Dec 07   Wintertime In Bunntyown! 0. 1-17                15 Dec 07   Those Wacky Bunnies! 0. 1-21                15 Dec 07   Bumbling Bunnies! 0. 1-23                15 Dec 07   Bunnytown Chuckles! 0. 1-24                15 Dec 07   What a Bunnytown Hoot! 0. 1-26                15 Dec 07   Get Fit, Bunnytown! 0. 1-27                15 Dec 07   Groovy Bunnies! 0. 1-28                15 Dec 07   Bunnies Bunnies Bunnies! 10. 2- 1                 5 Jan 08   Bunnies-A-Go-Go? 11. 2- 2                19 Jan 08   G'day Bunnies! 12. 2- 3                 9 Feb 08   Carrot Giving Day! 14. 2- 4                 1 Mar 08   Bunnytown Pets! 14. 2- 6                23 Feb 08   Bunnytown Fun! 16. 2- 6                25 Mar 08   King Bunny's Birthday! 16. 2- 7                28 Mar 08   Bunnytown Follies! 16. 2- 7                27 Mar 08   Bunny Blankie Blues! 18. 2- 9                 5 Apr 08   Bunnytown Babbles!